I wasn't the biggest fan of the first Thor film - look it was an enjoyable 3D Summer spectacle but I felt it didn't quite capture the Thor I wanted. I struggled with the more fantastical elements of the Asgardian world, this is something that I always struggled with reading the comics as well as the larger Cosmic parts of the Marvel Universe. 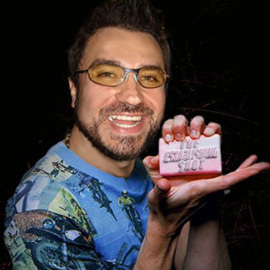 But something wonderful happened awhile back in discussion with Phil Edwards and Mark Wassmer of Live For Films about Avengers Assemble and The Dark Knight Rises, this was before either of those films were released and they were firmly in the Marvel marketing camp whilst I again was defending DC's flagging attempts. We got to the part in the conversation where Marvel's Guardians of the Galaxy became the focus - now I had attempted to read a couple GOTG comics when I was a kid and really didn't get into them. But both Phil and Mark said that the new stuff was great and I really should read the "Cosmic stuff". I responded with I hate that Cosmic stuff - both of them chuckled and Phil says That's exactly what Star-Lord or Peter Quill would say. Now I knew Star-Lord from the brilliant Marvel Preview line so I thought I would look into it. Well just over a year later I did and I managed to make may way through most of the Cosmic reading list. 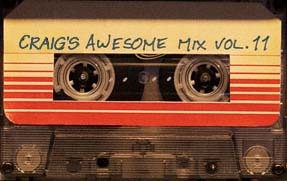 Including the Guardians of the Galaxy story arc. I was absolutely blown away I couldn't put the comics down and rushed through many of them in days. I became a huge Guardians of the Galaxy fan and a by product of this was that I know now who the aliens in Avengers Assemble were as well as their place in the larger scope of things (they are only the beginning). Why am I telling you this well there is some crossover into Thor's world and reading the Cosmic arcs not only reversed my opinion on it, but put the other areas of the Marvel Universe in the shade - for me the cosmic elements are now the strongest part of the Marvel Universe and I can't wait to see it explored on screen. 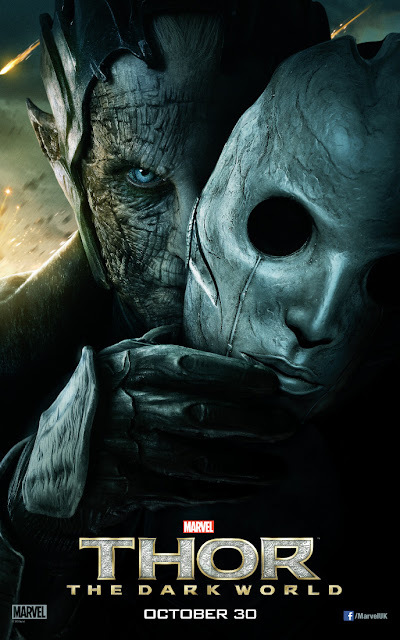 and that includes seeing what Alan Taylor does with Thor: The Dark World. "With the overwhelming success of Iron Man, will that become a template for further Marvel films, or will Thor be darker or have more pathos?”"
You'll know I wanted Thor to be different from Iron-Man. I loved Iron-Man but I want Thor to live in a universe that feels like it has god and monsters and all sorts of Cosmic elements to it not just a spin off of the world Iron-Man lives in. He is the God of Thunder. 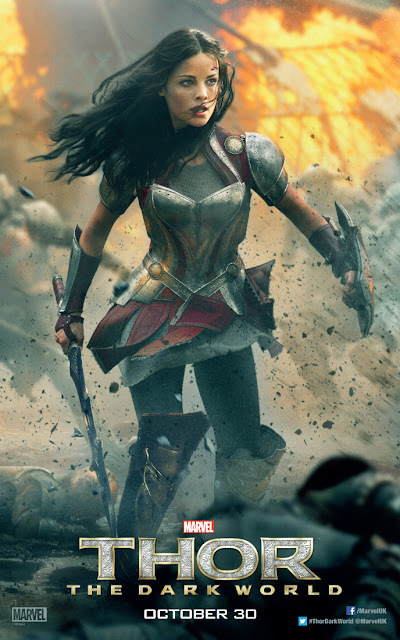 Well it looks like Thor: The Dark World is going to address this. 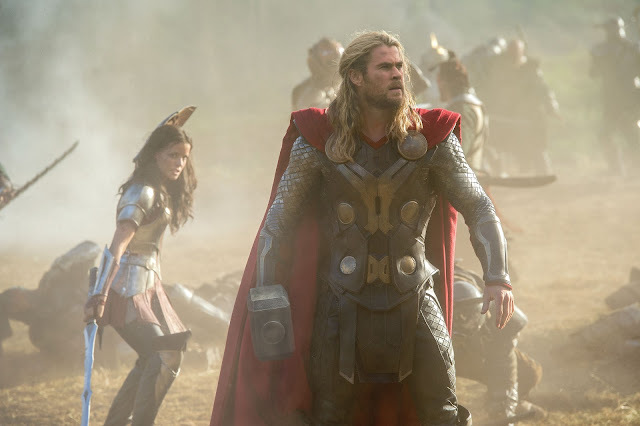 Marvel’s "Thor: The Dark World" continues the big-screen adventures of Thor, the Mighty Avenger, as he battles to save Earth and all the Nine Realms from a shadowy enemy that pre-dates the universe itself. In the aftermath of Marvel’s "Thor" and "Marvel’s The Avengers," Thor fights to restore order across the cosmos...but an ancient race led by the vengeful Malekith returns to plunge the universe back into darkness. Faced with an enemy that even Odin and Asgard cannot withstand, Thor must embark on his most perilous and personal journey yet, one that will reunite him with Jane Foster and force him to sacrifice everything to save us all. 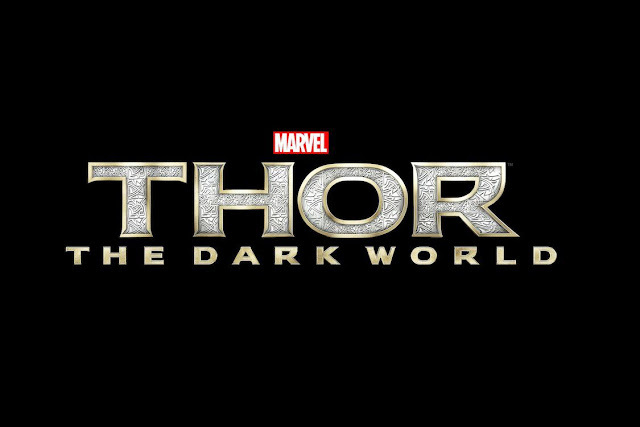 We can expect to see Alan Taylor's Thor: The Dark World in UK cinemas from 30 October 2013. 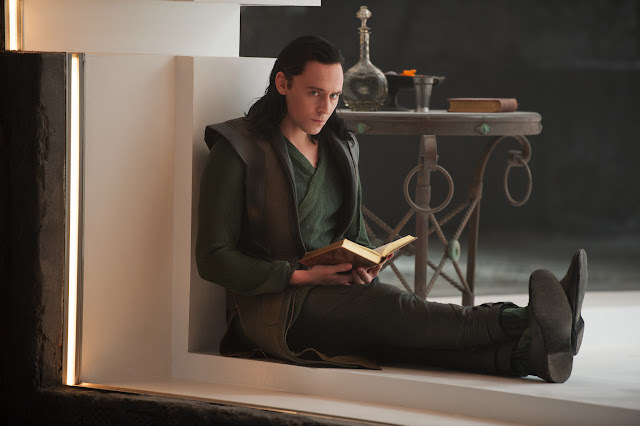 In the meantime below I'll be updating this post with all the official news you need to know about Thor: The Dark World. 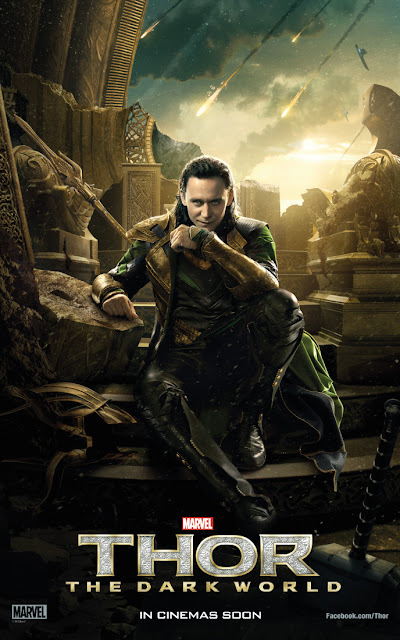 - Thor: The Dark World Gets a Comic-Con Poster! Marvel Studios’ latest release, THOR THE DARK WORLD has created a storm over the UK, hammering home an opening box office of £8.65 million. 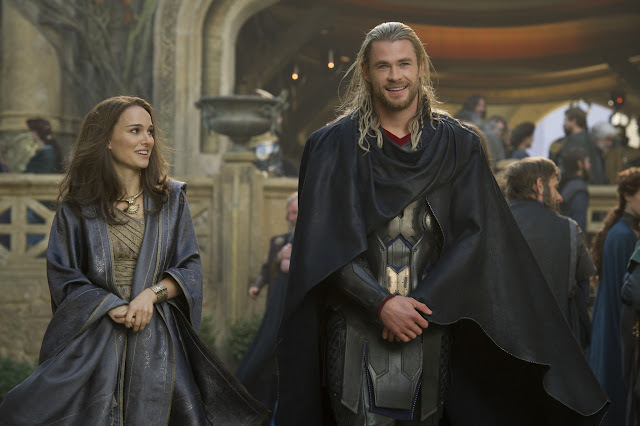 The result, which includes a 3 day weekend total of £5.54 million, sees THOR THE DARK WORLD take more than double the result of the current number two film, making it the clear number one film in the UK. 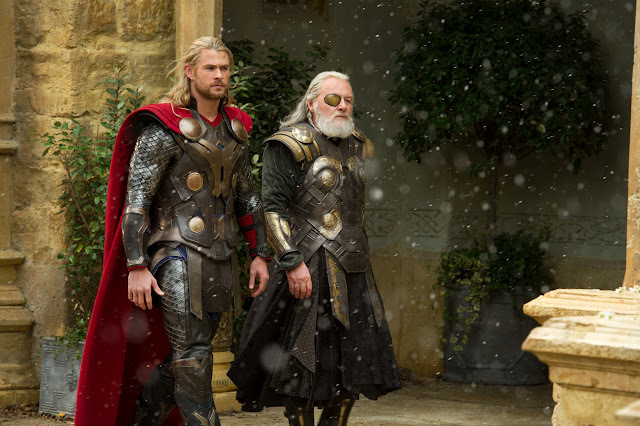 The weekend result has also eclipsed the entire first week box office of the first film, Marvel’s THOR. 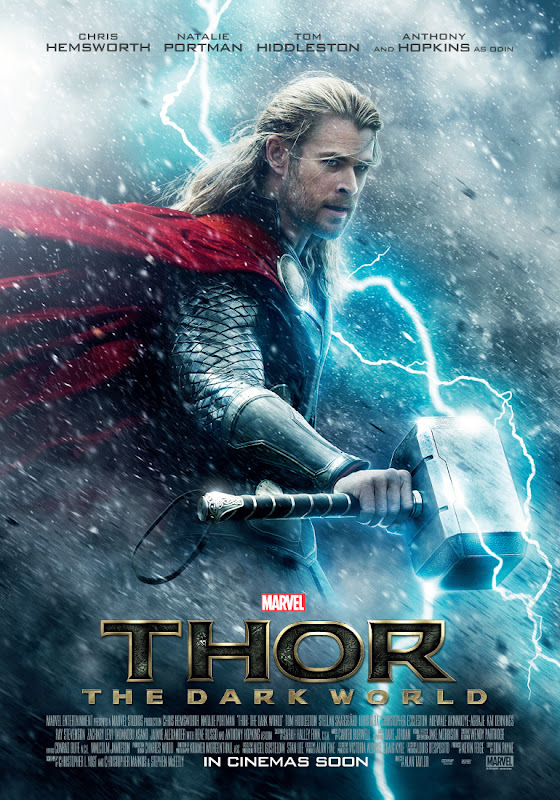 THOR THE DARK WORLD, which continues the big-screen adventures of Thor, the Mighty Avenger, following Marvel’s THOR and Marvel’s AVENGERS ASSEMBLE, also achieved global success by opening as the number one film in countries including France, Germany and Spain taking $109.4 million worldwide in its first weekend. 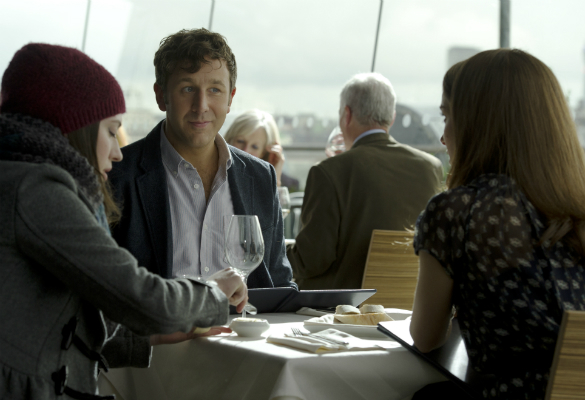 The film flies into US cinemas from November 8th. THOR THE DARK WORLD sees Thor battle to save Earth and all the Nine Realms from a shadowy enemy that predates the universe itself. In the aftermath of Marvel’s THOR and Marvel’s AVENGERS ASSEMBLE Thor fights to restore order across the cosmos...but an ancient race led by the vengeful Malekith returns to plunge the universe back into darkness. Faced with an enemy that even Odin and Asgard cannot withstand, Thor must embark on his most perilous and personal journey yet, one that will reunite him with Jane Foster and force him to sacrifice everything to save us all. To celebrate the release of the latest blockbuster adventure from the ‘Mighty Avenger’, THOR THE DARK WORLD, Marvel and Walt Disney Studios are marking the return of darkness to the UK by hosting an exclusive first look screening of the film as the clocks go back in the early hours of Sunday October 27th, giving fans the first chance to see the film ahead of its UK release on October 30th 2013. 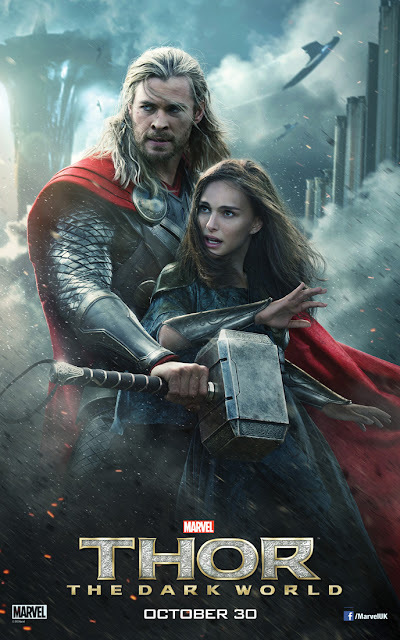 Taking place in Greenwich, the epicentre of GMT and key filming location in THOR THE DARK WORLD the film will be screened exclusively to fans who will get the chance to win tickets via Marvel UK’s social channels and exclusive competitions. Fans will be treated to a midnight reception in the magnificent Painted Hall at the Old Royal Naval College – a key location used within the film - before being some of the first in the UK to see the new movie from Marvel Studios, the creators of this year’s blockbuster sensation, Iron Man 3 and one of the biggest films of all time, Marvel’s Avengers Assemble. The film will begin at 1am – the exact moment that clocks around the UK are turned back one hour plunging UK nights back into darkness. 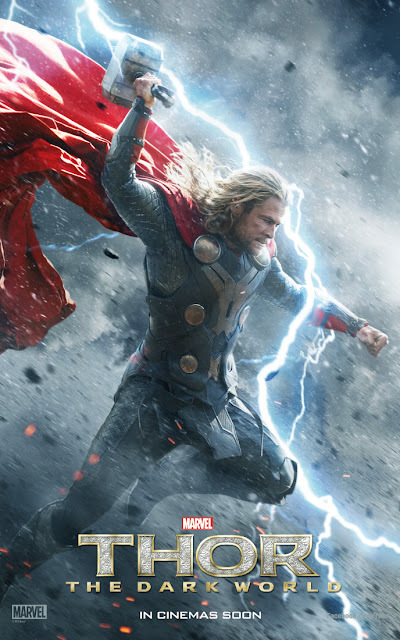 THOR: THE DARK WORLD continues the big screen adventures of Thor, the Mighty Avenger, as he battles to save Earth and all the Nine Realms from a shadowy enemy that pre-dates the universe itself. In the aftermath of Marvel’s Thor and Marvel’s Avengers Assemble, Thor fights to restore order across the cosmos...but an ancient race led by the vengeful Malekith returns to plunge the universe back into darkness. Faced with an enemy that even Odin and Asgard cannot withstand, Thor must embark on his most perilous and personal journey yet, one that will reunite him with Jane Foster and force him to sacrifice everything to save us all. The Old Royal Naval College in Greenwich, setting of a major battle scene in THOR THE DARK WORLD, is one of London’s most iconic sites. The stunning Painted Hall, which took its artist almost 20 years to complete, is the jewel in its crown. 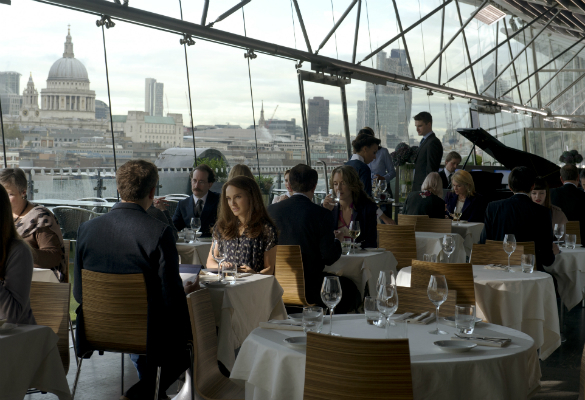 Fans not lucky enough to win tickets to this exclusive event can still visit Sir Christopher Wren’s masterpiece to see where the scenes were filmed as it is open to the public daily. 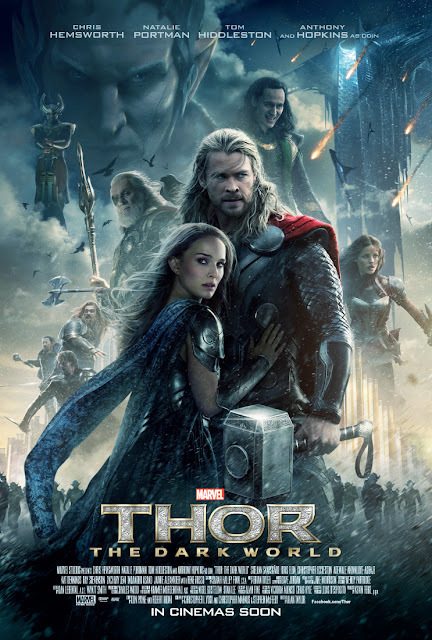 From Marvel Studios comes the highly anticipated “Thor: The Dark World,” continuing the big screen adventures of Thor, the Mighty Avenger, as he battles to save Earth and all the Nine Realms from a shadowy enemy that pre-dates the universe itself. In the aftermath of Marvel’s “Thor” and “Marvel’s The Avengers,” Thor fights to restore order across the cosmos...but an ancient race led by the vengeful Malekith returns to plunge the universe back into darkness. Faced with an enemy that even Odin and Asgard cannot withstand, Thor must embark on his most perilous and personal journey yet, one that will reunite him with Jane Foster and force him to sacrifice everything to save us all. In 1962, the now-legendary duo of Stan Lee and Jack Kirby introduced “The Mighty Thor” to readers of Marvel Comics, unleashing a new era of action-adventure with their take on the hammer-wielding Norse god. Despite the Nordic-sounding names, the story was rooted in familiar, universal conflicts that have driven human drama since the beginning of time: a son impatient to prove his worth to his father; a lethally resentful brother; and a woman who helps a man see the world anew. 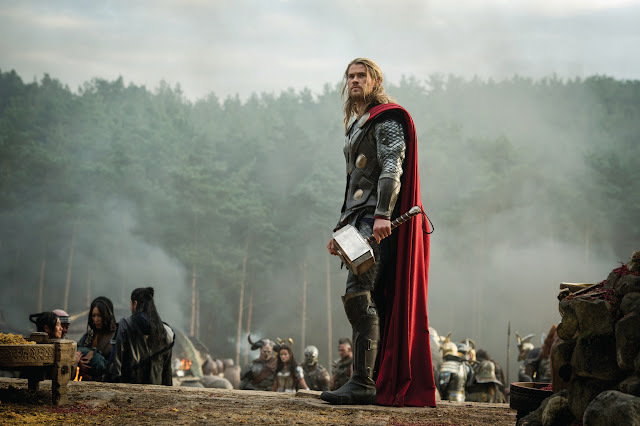 After the global cinematic success of Marvel’s “Thor,” the filmmakers reached once more into a rich archive of Norse mythology and comic book history for Marvel’s “Thor: The Dark World.” The movie paints an adventure of the most epic and spectacular proportions. Again drawing on universal and familiar themes, the film pits duty and family allegiance against personal aspiration and love. It sees a nation in conflict with an enemy long thought to be dead, but who now threatens the very existence of the universe. 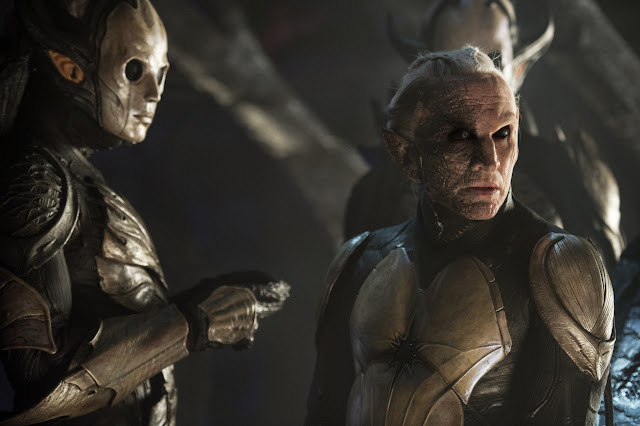 To create the conflict, the film-makers give Thor a worthy adversary—the villainous Malekith. 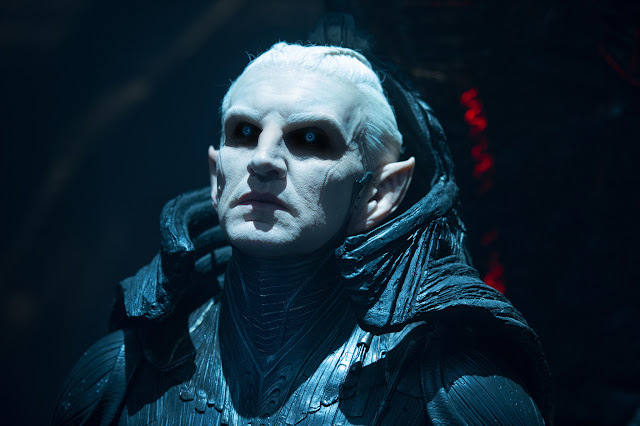 Introduced in June 1984 in issue #344 of Thor, Malekith is leader of the dark elves, who inhabit Svartalfheim, one of the Nine Realms. 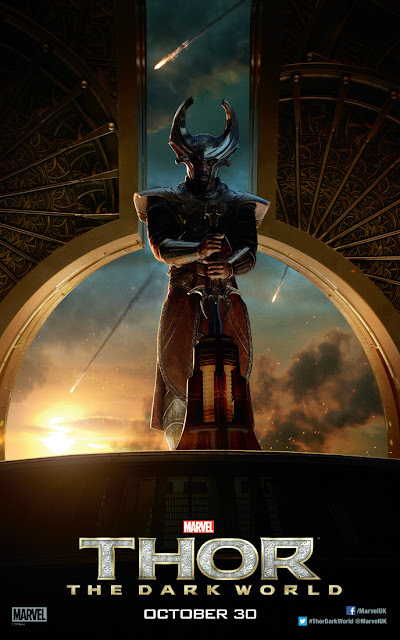 After waging war with the Nine Realms, and being defeated by Asgard, the dark elves were considered to be extinct. 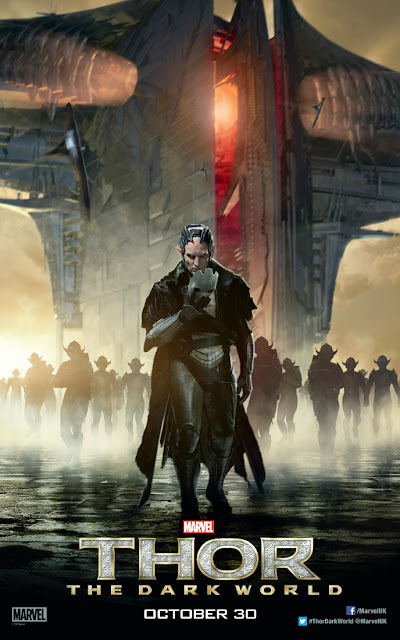 But Malekith put his planet and the surviving dark elves into hibernation for many thousands of years, until a calculated time when he was ready to avenge the universe and turn light once more into darkness. 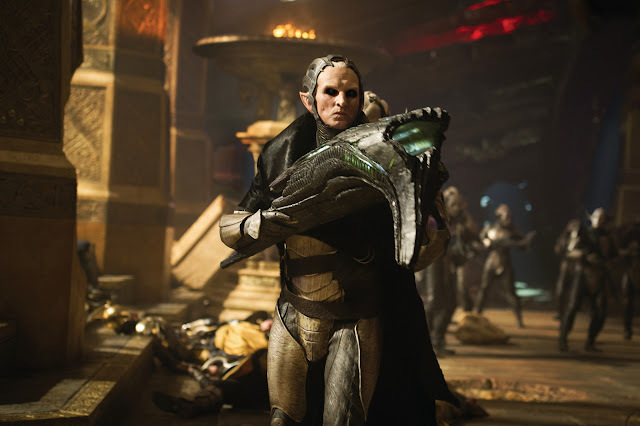 Malekith and the dark elves will prove to be formidable enemies with a violent and personal history with Asgard. 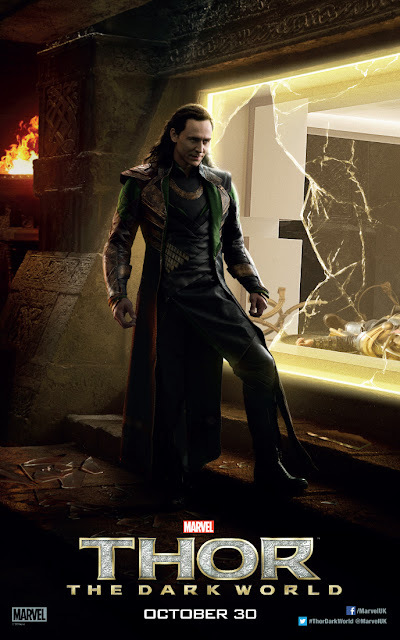 In creating “Thor: The Dark World,” Marvel filmmakers worked diligently to respect the film’s origins and the legions of comic book fans it spawned and worked carefully to endear and excite not only those fans but fans of the Marvel Cinematic Universe as well. 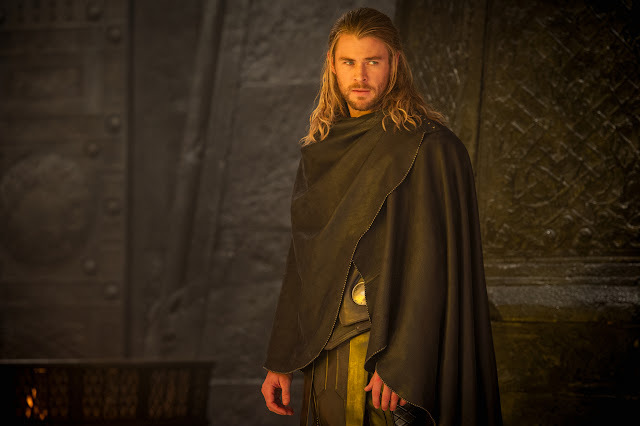 As a result, all aspects of “Thor: The Dark World,” —from the locations, the vast, largely exterior sets, the costumes, hair and make-up, to the armor, weapons, special and visual effects—have been carefully crafted to give a worn, humanizing, historical and grounded quality, with more nods to a Viking era than to science fiction. 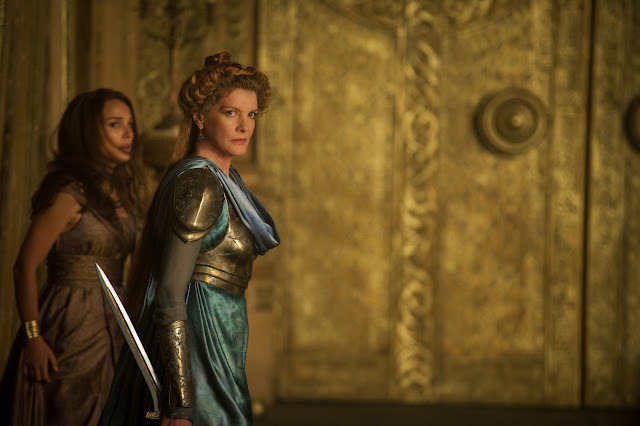 To create Asgard and further worlds within the Nine Realms with believability, the director and filmmakers felt the best way to help achieve this was to use a combination of real locations and expansive, detailed sets, built largely outside. The film shot between October and December 2012 at Shepperton Studios in England, with key locations in London—Greenwich, Wembley, St. Paul’s Cathedral, Borough Market and Hayes—Bourne Wood in Surrey and Stonehenge in Wiltshire, England, and Iceland. 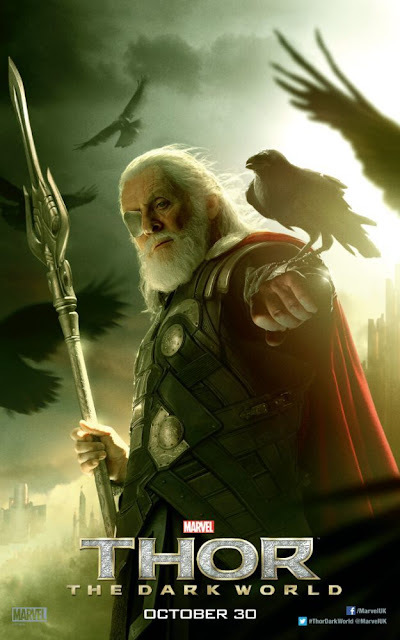 - In “Thor: The Dark World” more of the Nine Realms are introduced, offering a better understanding of the history and complexities of Thor’s universe. The Nine Realms are taken from Norse mythology and refer to the nine worlds that are supported by Yggdrasil, an immense ash tree, central to Norse cosmology. Asgard is depicted at the top and Earth, known as Midgard, in the middle. In the original “Thor,” Yggdrasil was established as a cosmic structure formed by a series of interwoven wormholes linking the nine worlds (Realms) together. - The Medina/streets of Asgard set is the biggest set ever built for a Marvel film. One can actually walk around the streets of Asgard and see the shops, the pubs and the training ground. - An aerial camera crew flew to the Dettifoss waterfall in Iceland (Europe’s most powerful waterfall) to film the cascading waters from every angle so that the waterfalls ringing Asgard could be rendered realistically by the computers to replicate the world. - Filming in Iceland involved remote locations where the crew had to drive for hours from the airport just to get to their hotels. Then, to get to the fields of volcanic ash that stood in for The Dark World, they drove for up to two hours more. Photos of young Jane Foster in the apartment set were courtesy of Natalie Portman’s mother, who keeps a binder filled with photos of Natalie at different ages for occasions like this. 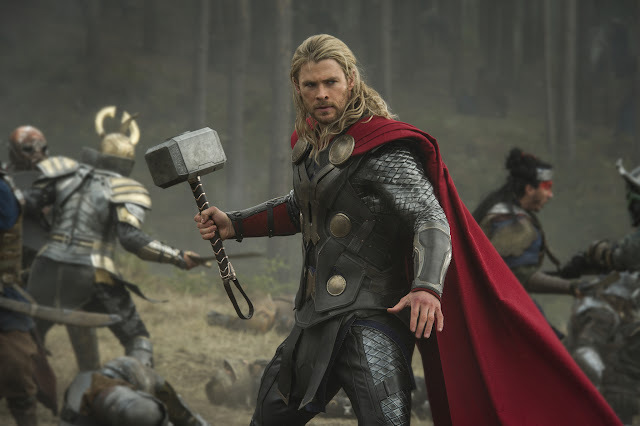 - There were about 30 hammers made for Thor of various weights for different uses. The master hammer is made from aluminum but it is replicated in different materials and weights, including a “soft” stunt version. Of the 30, five versions are used most often, including the “lit hammer,” that emits light when lightning strikes. - Prop master Barry Gibbs and his team of 18 technicians designed/produced 140 weapons in 10 weeks, then went on to make four more of each weapon for a grand total of 516 weapons for the Marauders to use in the battle scenes. This is before he even got into making the principal weapons for Thor, Odin, Volstagg, Heimdall, Sif, etc. 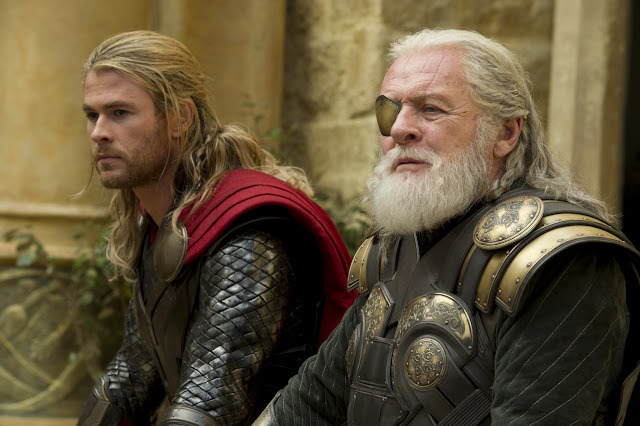 Thor and Odin each have one look in costuming, but Thor needs 15 sets of his costume as he does so many stunts and action scenes. Odin has about 6 repeats of his costume. 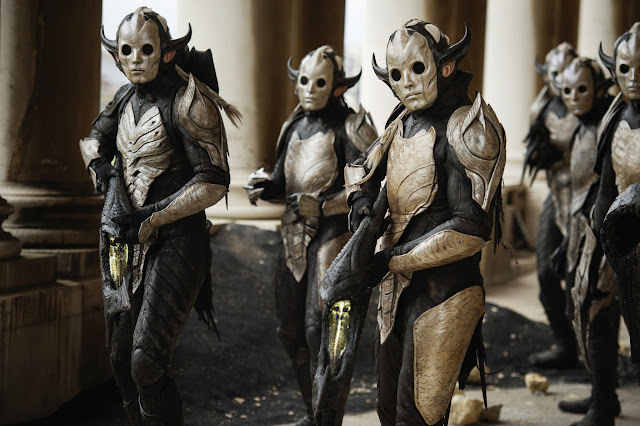 David White, the designer of the dark elves and the prosthetic effects on “Thor: The Dark World,” designed and created 40 suits for the dark elves, utilizing 100 technicians over a 3 ½ month period. The off-world look was derived from diverse ethnic and tribal elements. 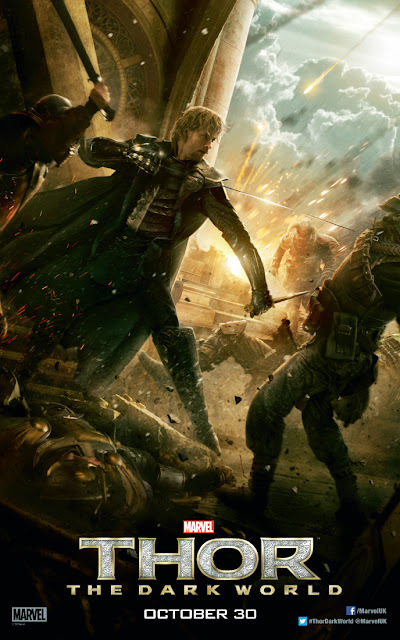 - The stunt men and extras playing the dark elves had to go through a training period where they practiced standing tall and proud since the dark elves are envisioned to be a noble people. Prosthetics designer David White helped out too by designing the helmet so that the eye line was slightly pulled down, forcing the actors to tilt their heads slightly up and back, which gave them a very proud, strong feel. 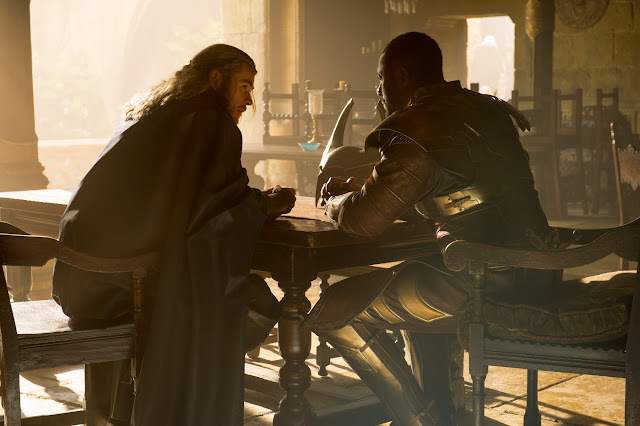 - Both Christopher Eccleston and Adewale Akinnuoye-Agbaje, who play the dark elves Malekith and Algrim, respectively, had to memorize their dialogue written in an elven language that was created specifically for the film. - The film shot between October and December 2012 at Shepperton Studios in England, with key locations in London—Greenwich, Wembley, St. Paul’s Cathedral, Borough Market and Hayes—Bourne Wood in Surrey and Stonehenge in Wiltshire. For the look of the dark elves’ world, Svartalfheim, the filmmakers chose Iceland for its black, volcanic landscapes. - Before sending helicopters to film over historic Greenwich, England, on a quiet Sunday morning, the location crew dropped 4,000 letters in the area: 2,000 on one side of the river and 2,000 on the other side of the river, explaining to the residents what was going to be happening. 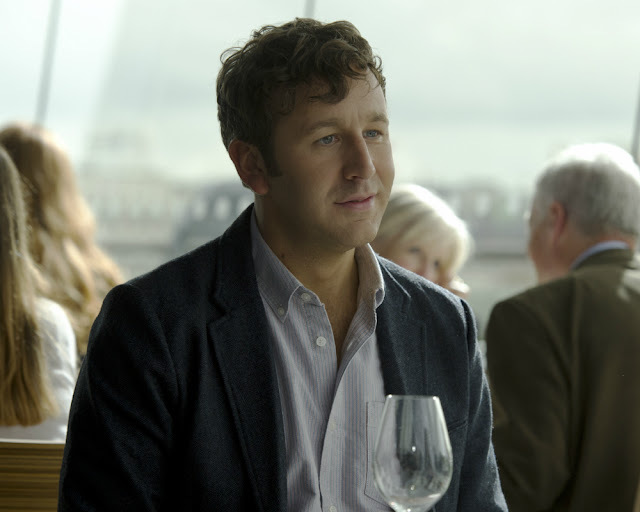 - Filming at the famous Stonehenge historical site proved to be a challenge. 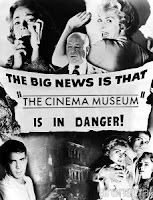 After finally getting permission from English Heritage, the filmmakers found out that there were lots of rules and regulations associated with filming there. They could only be in amongst the stones outside of the normal visiting hours. So shooting had to take place early in the morning before opening, which only gave the film crew about three hours before they had to pull back for wider shots once the stones were opened to the public. Being a heritage site, no one was allowed to touch the stones or walk on any stones, so a lot of logistics had to be applied to the filming there. 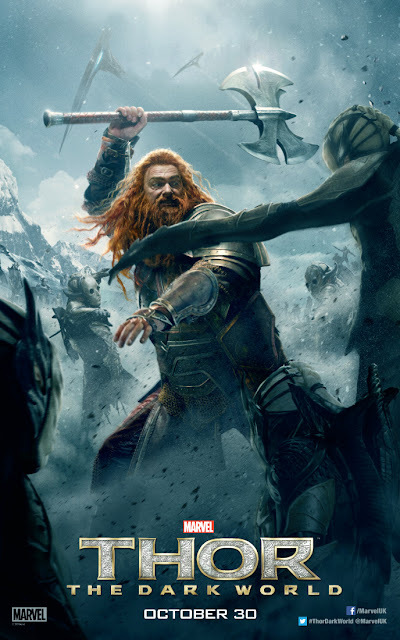 Is that Loki fighting Dark Elves behind Thor?